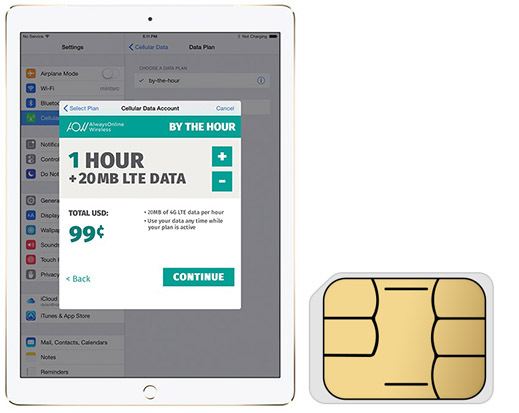 AlwaysOnline Wireless, one of the data providers for the Apple SIM built into newer iPads, today announced new, more affordable pricing for its LTE data plans in the United Kingdom, which can be used by both domestic UK residents and travelers who visit the UK. The company offers a range of short-term data plans for iPads equipped with an Apple SIM, providing plans by the day, hour, or megabyte. AlwaysOnline Wireless offers connectivity in 74 countries, but today's price drop is limited to the UK. Pricing in other countries varies. An hour of connectivity with 100MB of data is now priced at $0.11 in the United Kingdom, a significant price drop from the original cost of $0.49. A daily plan, with 500MB, now costs $2.99 (down from $5.99), and 1GB, 3GB, and 5GB plans with a 30 day limit are available for $5.99, $9.49, and $14.99, respectively. Previous pricing was at $10.99, $18.99, and $29.99. The Apple SIM, introduced in 2014, works with cellular models of the iPad Air 2, iPad mini 3, iPad mini 4, 12.9-inch iPad Pro, and 9.7-inch iPad Pro. It is designed to support wireless service across multiple carriers, making it easy for customers to switch cellular providers, something that's especially useful for travelers. Apple SIM is supported by AT&T, Sprint, and T-Mobile in the United States, along with EE in the UK, au and SoftBank in Japan, Deutsche Telekom in Germany, and Three in Hong Kong. GigSky and AlwaysOnline Wireless, two companies that offer coverage around the world, also support Apple SIM. Apple SIM connectivity is available in more than 140 countries, primarily through Apple's partnerships with GigSky and AlwaysOnline Wireless. Oh sweet I'm definitely going to move to the UK to take advantage of this!! !